The Vision’s Ephesus and Pergamon guide book contains the history and the architectural details of the fascinating monuments of Ephesus and Pergamon, along with 14 past & present images. This is the french edition. Free CD / DVD Rom included. Author: Eugenia Equini Schneider, Full Professor of Roman Provinces Archaeology at the University of Rome “La Sapienza”. This product is temporarily out of stock, sorry. Please, come back in a few days. In the Vision’s Ephesus and Pergamon guide book you will find the history and the architectural aspects of the monuments of Ephesus and Pergamon, together with many historical curiosities about the two cities of Ancient Greece. 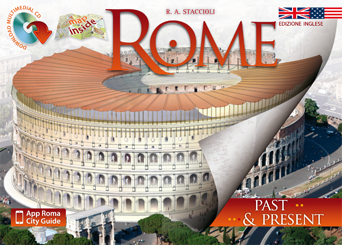 And you will find 14 amazing graphic reconstructions of the most fascinating monuments and temples of Ephesus and Pergamon, that you will be able to easily overlap to photos of their present states, visually comparing the Past and the Present. 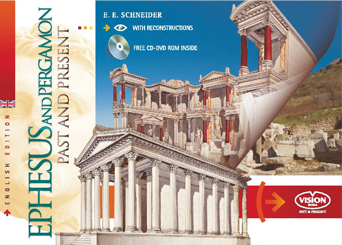 The Ephesus and Pergamon guide book includes a CD / DVD Rom. Reconstructions: 14. Ephesus: Temple of Artemis, Agora, Temple of Domitian, Memmius Monument, Nymphaeum of Trajan, Hadrian’s Temple, Agora tetragonal (2), Celsus Library, the Theatre, the Arcadiane. Pergamon: Temple of Trajan, Altar of Zeus, Temple of Demeter.